It is time for the next letter in Historical Tapestry's Alphabet in Historical Fiction, and we are up to the letter D. For the letters A and B I reposted reviews of books that I absolutely loved, and for C I posted reviews of Conn Iggulden's Genghis Khan trilogy, but this time I am highlighting a book that I haven't read yet, but one I am waiting for very impatiently. The book, The Endless Forest by Sara Donati, was actually released in the US last week, but I haven't seen it in any of the shops here yet. I suspect it will start to appear on our shelves after 1 February. There are certain series that I read that I could not tell you how I started to read them. There are others that I know exactly how they came to be on my reading radar, and Sara Donati's Into the Wilderness is one of those series. I have posted previously about this (click on the link to above to read how), but to summarise, I read Diana Gabaldon's books, and then was hanging around with fellow Gabaldon fans I found out about several of my now favourite authors - Sharon Kay Penman, Paullina Simons, and Sara Donati included. The Endless Forest is the sixth, and final, book in the Into the Wilderness series. Over the last six years I have enjoyed reading along with the Bonners of Paradise, meeting their family and friends, and along the way spending time in northern USA, Canada and New Orleans, but now it is coming to an end. Whilst I am excited at the prospect of seeing what happens next, I am also saddened to know that this is the end of the road for the characters that we have come to know and love in that time. Well, it's not really, but now they get to live their lives without having thousands of people reading over their shoulders to see what they all do next! It is even sadder knowing that Rosina Lippi (who writes as Sara Donati) has given up writing fiction for now, so there is no prospect of anything new from her pen in the immediate future either. I guess that means that I need to make more of an effort to go and track down the one book that I haven't read of hers yet, Homestead. Maybe I am getting a bit ahead of myself in talking about The Endless Forest. I read the first four books in this series before I started blogging, and so there is only one review for this series on my blog. So here is a brief run down of the series (please note there may be brief spoilers in the descriptions for the previous books in the series). The first book in the series is Into the Wilderness, and it was inspired by the movie Last of the Mohicans starring Daniel Day Lewis who starred as Hawkeye, which in turn was an adaptation of James Fennimore Cooper's book of the same name. Hawkeye is a character in the novel, but the main male character is Nathaniel Bonner, his son. The story starts when a prim and proper English spinster arrives in Paradise to act as a teacher in the small frontier town. Her father has bought her to Paradise with the intention of marrying her off to the town doctor (without telling Elizabeth), but it is Nathaniel who catches her eye. Nathaniel has spent a lot of time with the Mohican, was married to a Mohican woman, and his daughter, Hannah, is half Mohican, meaning that there is an interesting mix of frontier storyline with a sympathetic portrayal of the Native American side of the story. Ana recently reviewed Into the Wilderness over at Historical Tapestry. The second book in the series is Dawn on a Distant Shore, and the action starts up not long after Into the Wilderness ends. Nathaniel and Elizabeth are now married, and Elizabeth gives birth to twins whilst she is accompanied only by her step-daughter Hannah. Nathaniel has gone to Canada to try and release his father who has been arrested by the British, but finds himself captured as well. Elizabeth now needs to go and get them both, and through a series of events, does so, but then the family finds themselves headed to Scotland, where a distant relative, the Earl of Carryck, has a mind to manipulate the family into doing what he wants to do. A lot of this book is set on board a boat, and in Scotland. One of the most important things in this novel is the introduction of the character of Jennet, headstrong and beautiful, who plays an influential role in future books. The third book, Lake in the Clouds, see the Bonners return to their home on Hidden Wolf Mountain, near the small town of Paradise, and the book is better because of the return to the original setting. This book sees Hannah come to the fore as a character as she tries to find her place in a society where she is not fully white, and not fully Mohican. Her journey towards adulthood is further complicated by the fact that she wants to be a doctor. It is almost unheard of for a young woman to be a doctor, let along a young Native American woman. Other themes in the book include the smuggling of slaves to freedom in Canada, and facing the dangerous men who chase those slaves, including a face from the past. The fourth book in the series is Fire Along the Sky, sees Hannah once again playing a starring role, but also the twins come into age. Lily is another headstrong and beautiful young woman who wants to get out of Paradise and see the world, but the beginning of the 1812 war has interrupted those plans. Ten years have elapsed between these two books, and there have been many changes, most notably for Hannah. In this book, Hannah is a shadow of her former self, having undergone enormous personal tragedy. It is only in caring for others that she is able to undergo some personal healing, and begins to find purpose and fulfillment. The war looms large in this book, with Lily's twin Daniel enlisting to fight, only for fate to once again find a Bonner imprisoned in Canada. With the colourful Jennet back in the story, and yet more surprises in store, this is another good read. The fifth book in the series, and in my opinion, the most satisfying, Queen of Swords, sees a lot of the action moving away from Paradise to New Orleans, where the 1812 War continues. This book starts at a rapid pace with the Bonners headed to New Orleans in pursuit of the kidnapped Jennet. The highlight of this book character wise was definitely Ben Savard, a man who knows everyone, who can get things done, and who seems to have the key to Hannah's heart. If there is one thing that I am looking forward to in The Endless Forest it is getting to see Ben again! This is the one Wilderness book that I have reviewed, so if you are interesting, click on the link to read more. So there you have it, a brief journey through the Into the Wilderness series by Sara Donati, and my entry for D in the Alphabet in Historical Fiction challenge being hosted by Historical Tapestry. Writing this post has achieved two things. The first is to make me more eager to read The Endless Forest, an experience I am sure will be bitter sweet, and the second is to make me want to reread the series from the beginning! Seeing as I wanted to highlight The Endless Forest, it seems only fitting to share the synopsis, as the closing part of this post. Thanks Marg for the run down of each book! I'm almost finished the second book in the series, it's on audio and whilst it's very long, I'm loving it. It is such a shame the Rosina Lippi isn't writing anymore fiction, actually it's a tragedy if you ask me! I'm like you, I came to her books by looking for books similar to the Cross Stitch (Outlander) series. I've had all five of her books for a few years but have been slow in reading them. My Dad died when I was reading the first one so I put it aside for quite a while. You know I originally bought the first book and Sheree (Teddyree) read it first and loved it so I bought the rest of the series for her to read knowing that I'd love it too. The Endless Forest will probably be out in the small size before I get to it though. But it will be this year, this is one of my must finish series for 2010. I have Into the Wilderness and didn't realize she had written this as part of a series! I've always thought my mom would like that particular book but never have gotten around to giving it to her. And I also have read one of her novels under the pen name Rosina Lippi and really enjoyed it. Now I need to check out these other books! Sounds like a great series - I'll look out for this author! Interesting setting too. I hadn't heard of this reading challenge. Beautiful button. I do read some historical fiction but i don't recognize these authors. Those letters you are using are gorgeous. It's what attracted me to the post. :) Happy reading. Oh Marg, you keep waving very tempting books in front of me. It's even worse when you wave an entire series in front of me. Now cut that out. LOL! I will have to decide on my "D" this week. Sorry Teddy! I think you would like this series, and it is a nice change to read some American history every now and again. I am sure I must have mentioned this series at least once before! I've already started giving my E letter some thought! It is very tempting to go for the obvious and do a post on Elizabeth Chadwick ... just for you! I love Sara Donati but I haven't read those last two yet. Great to see all the title images together! I'm not sure why I've never read any of Donati's work--for some reason I never latched on when I browsed by her. But your reviews have made me really reconsider! Then again--if she's not writing anymore--I'm not sure I want to get attached! I loved your thorough, eloquent description of this series. It sounds like something I'd really enjoy. Stephanie, I hope you get a chance to give Sara Donati a try. Rowenna, I know what you are saying about not wanting to get attached if she isn't writing any more, but you would really be missing out on a good series if you didn't ever give her a try. Cat, Queen of Swords is my favourite...so far. I am waiting very anxiously for the last book to find it's way into my hands! 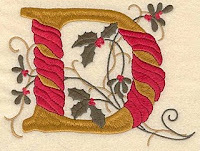 Sandra, I wish I could take credit for the letters, but one of my fellow team members at Historical Tapestry is the artistic genius who does all this kind of stuff for us. I am glad it worked in catching your attention though. Danielle, if you have already read Rosina, then you will have a fair idea of the feel of her writing, although the settings are very different. I hope you, or your mum, get a chance to read Into the Wilderness soon. Alaine, I hope you get to read more of the series soon. I know that you read Dawn on a Distant Shore recently, and I think the books get better from that point on. This certainly made my day. Thank you so much for providing such an engaging overview and summary. I'll put a link to it on my web page, because you've done a better job of summarizing the whole series than I could have. When you do get around to reading The Endless Forest, I hope you'll share your thoughts here. Queen of Swords and Lake in the Clouds are my two favorite novels in the series, I think because I so much enjoyed doing the research in both cases (Manhattan 1802, New Orleans 1813-15). As far as writing fiction is concerned, I do hope to get back to it. Please don't give up on me entirely. And now you have made my day! Although you already new that I was a fan from way back on the discussion boards and your blog! I just finished The Endless Forest and absolutely loved it. It might have been a mistake to read the epilogue at the hairdressers, but still! The whole way through the book I was thinking I really need to start at the beginning again, and so I am, and I am once again loving reexperiencing those heady early days between Nathaniel and Elizabeth. I will be watching to see if and when you do come up with something new for sure. Teaser Tuesday: Do you know what book it is? Any Gardener types out there?